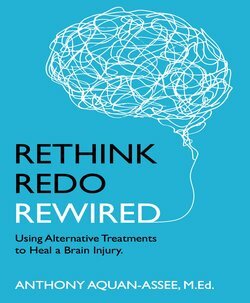 Rethink Redo Rewired – ANTHONY AQUAN-ASSEE, M.Ed., B.Ed., B.Sc. *** The cost for shipping depends on the shipping address. Read this book to learn about Alternative Treatments that can help you heal yourself naturally and be medication free. In this book, Anthony shares how neurofeedback, cranial electrotherapy stimulation, laser therapy and drinking kangen water helped him heal his brain and body in ways that pharmaceuticals couldn’t. These alternative treatments helped to awaken his brain’s healing capacity and he was able to heal himself naturally. No medication needed! Anthony is no longer taking any medication for his brain injuries or the other injuries he sustained in his accidents. The human body is a magnificent creation born with all the tools to heal itself. It is time for us to rethink, redo, and rewire ourselves to harness the mind, the body, and the spirit as allies in healing. We can heal ourselves.